Within a year, one of the country’s largest ever developments could be underway at Ruakura. Hamilton City Council has approved three key resource consents for the mammoth project, which chief executive Chris Joblin says paves the way to start developing the first 13.5 hectare stage of the inland port and surrounding 34.5 hectare logistics zone within a year. “We have always approached Ruakura as part of a bigger picture – a new development larger than the Auckland CBD bringing fresh life and jobs to east Hamilton, and as a key hub in the upper North Island freight system,” Joblin says. Tainui Group Holdings (TGH) has already received a number of expressions of interest about hubbing through Ruakura from leading players in the import, export and logistics sector, although it is yet to commence formal marketing. In the second quarter of this year TGH will call for expressions of interest from port operators to manage the secure gate-in, gate-out inland port eventually capable of handling up to 1 million twenty-foot-equivalent (TEU) containers per year. 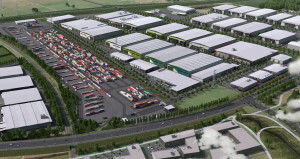 The inland port and logistics zone will anchor the entire 480 hectare site, which also features the equivalent of more than 52 rugby fields of green and open space, a light commercial knowledge zone and residential housing. Waikato Chamber of Commerce chief executive William Durning says the Ruakura development will “turbo-charge” the contribution of the wider Waikato region to the New Zealand economy.